Beginning a little before their first birthday and lasting until they are three or so, kiddos are all about repetitive motions: opening and closing doors, turning lights on and off, flicking every possible switch they can reach or climb to. Toddlers seriously can’t get enough of exploring these seemingly mundane objects and how they work, never realizing how important these actions are in building motor and cognitive skills. Since most of us don’t have daily access to a plane cockpit or a circuit board, we’d like to suggest a safer, home-friendly version: a busy board. Mortimer’s Busy Boards creates a huge variety of one-of-a-kind busy boards in two sizes that can be personalized with your child’s name or the alphabet (non-personalized options are also available). The wooden boards, which are sanded down for smoothness, feature zippers, spoons, a door handle, locks, a light switch, a call bell, a phone receiver, and a door knocker. Larger versions also include objects such as a mirror and a tambourine, and you can choose whether you would prefer a gender neutral or gender specific theme. If the price tag puts you off, feel free to DIY your own busy board, simply making sure that all the items are carefully secured and age-appropriate. One dad included carabiners, lights, a calculator, and magnetic letters for an inspired busy board that kept his little one occupied for hours. You know your child better than anyone else, so crafting her a busy board that includes her favorite everyday exploratory objects (as well as perhaps some new ones that might pique her interest) can be an inexpensive and efficient way to make your own hands-on, heirloom toy. Beginning a little before their first birthday and lasting until they are three or so, kiddos are all about repetitive motions: opening and closing doors, turning lights on and off, flicking every possible switch they can reach or climb to. Toddlers seriously can't get enough of exploring these seemingly mundane objects and how they work, never realizing how important these actions are in building motor and cognitive skills. Since most of us don't have daily access to a plane cockpit or a circuit board, we'd like to suggest a safer, home-friendly version: a busy board. Mortimer's Busy Boards creates a huge variety of one-of-a-kind busy boards in two sizes that can be personalized with your child's name or the alphabet (non-personalized options are also available). The wooden boards, which are sanded down for smoothness, feature zippers, spoons, a door handle, locks, a light switch, a call bell, a phone receiver, and a door knocker. Larger versions also include objects such as a mirror and a tambourine, and you can choose whether you would prefer a gender neutral or gender specific theme. If the price tag puts you off, feel free to DIY your own busy board, simply making sure that all the items are carefully secured and age-appropriate. One dad included carabiners, lights, a calculator, and magnetic letters for an inspired�busy board that kept his little one occupied for hours. 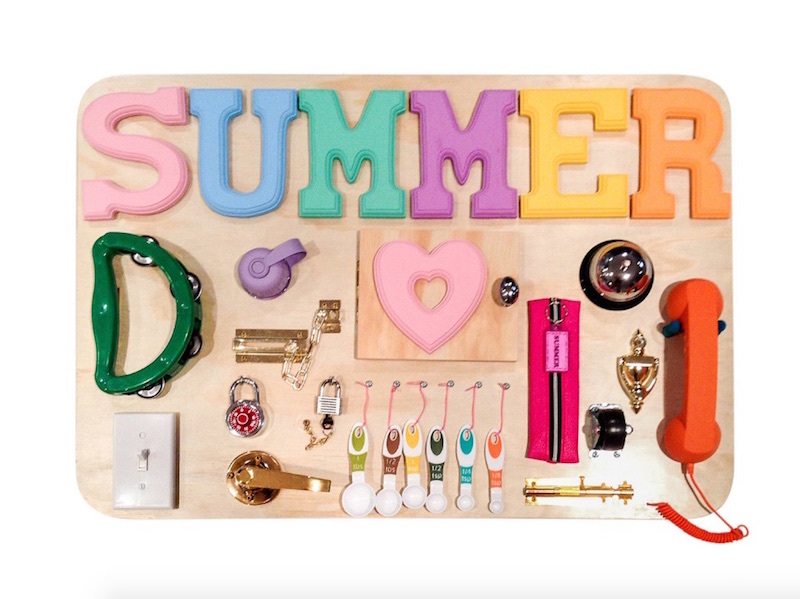 You know your child better than anyone else, so crafting her a busy board that includes her favorite everyday exploratory objects (as well as perhaps some new ones that might pique her interest) can be an inexpensive and efficient way to make your own hands-on, heirloom toy.